Explanation: As humans explore the universe, the record for largest asteroid visited by a spacecraft has increased yet again. Earlier this month, ESA's robotic Rosetta spacecraft zipped past the asteroid 21 Lutetia taking data and snapping images in an effort to better determine the history of the asteroid and the origin of its unusual colors. Although of unknown composition, Lutetia is not massive enough for gravity to pull it into a sphere. 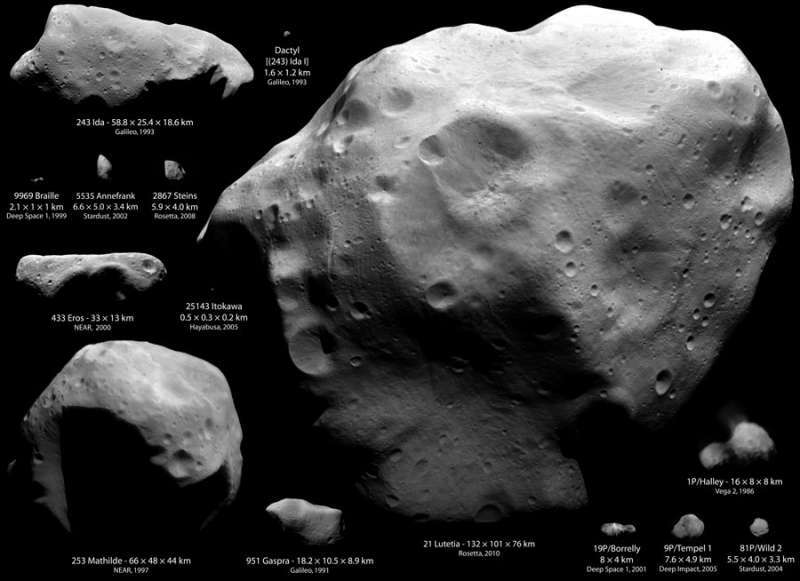 Pictured above on the upper right, the 100-kilometer across Lutetia is shown in comparison with the other nine asteroids and four comets that have been visited, so far, by human-launched spacecraft. Orbiting in the main asteroid belt, Lutetia shows itself to be a heavily cratered remnant of the early Solar System. The Rosetta spacecraft is now continuing onto comet Churyumov-Gerasimenko where a landing is planned for 2014.